I will be attending this session and would love to chat about training! Panelist, panel presentation hosted by ACRL Distance Learning Section. I do a lot of training on elearning development and accessibility. 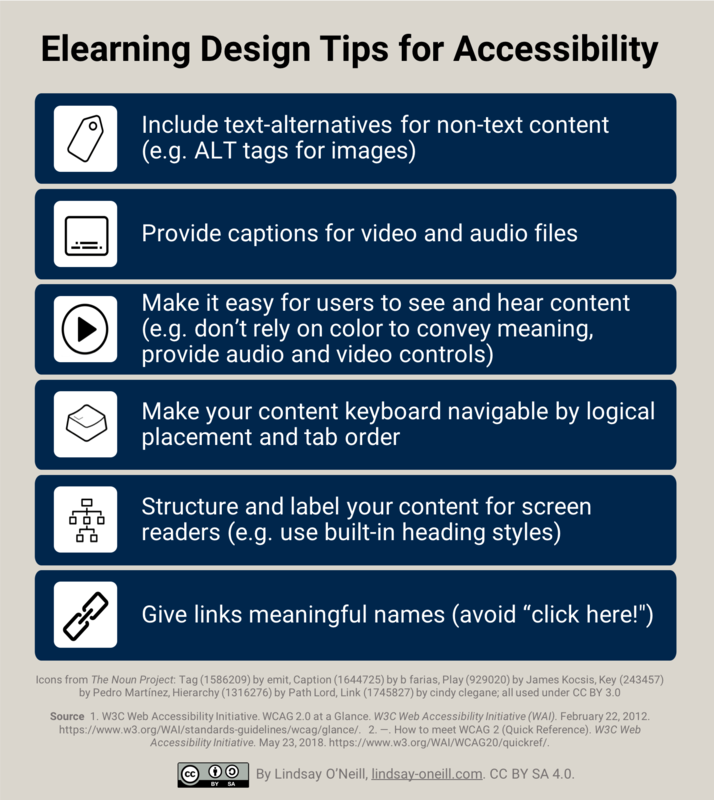 As a teaser for my poster session, here’s a very shareable infographic containing Design Tips for Accessibility! W3C Web Accessibility Initiative. WCAG 2.0 at a Glance. W3C Web Accessibility Initiative (WAI). February 22, 2012. https://www.w3.org/WAI/standards-guidelines/wcag/glance/. —. How to meet WCAG 2 (Quick Reference). W3C Web Accessibility Initiative. May 23, 2018. https://www.w3.org/WAI/WCAG20/quickref/. This infographic was created by Lindsay O’Neill, lindsay-oneill.com, CC BY SA 4.0.